“Since incorporating in 1997, we have been known as the industry’s leading socially responsible, values-based design house, bringing people and dogs together for fun and mutual support. The fire in our belly is to concept, innovate and develop premium products “made for dogs, by dog lovers” all while being fully dedicated to satisfying both you and your best friend’s needs. Our mission is to amuse, explore, support, innovate, create, educate, celebrate and philanthropate… all in the name of the dog. We “romp the romp” by providing financial resources to those in need, educating consumers about canine-related issues, creating an array of non-toxic and recyclable products, and keeping the tails of “our pack” wagging. For my review, I received Planet Dog’s On The Go Travel Bowl in Large and Small, for kibble and drink. 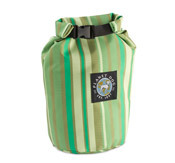 It is fully collapsible and can be stored inside of a backpack or a purse. The large size holds 2.25 quarts! The small size holds 1.5 quarts. This allows you to take your best furry friend on road trips. Not only is the travel bowl functional, it is pretty darn cute, as well! Collapsible, rollable, stuffable, very packable. Their On The Go Travel Bowl pops open for easy access and sits flat for stability. The perfect traveling companion for your favorite travel companion. Durable poly-canvas with PU coating. Available in seaside blue, sunset pink, harvest orange, forest green. I also received their On The Go Weekender Feedbag, which is also fully collapsible. It is water resistant with a tight velcro seal. The Weekender Feedbag holds 30 cups! WOW! I was so amazed at how much food it can actually hold. If you travel with your best friend, this On The Go Feedbag is for you. Carries plenty o’ kibble wherever your travels take you for that nice, relaxing weekend. Poly-canvas with water resistant coating. Machine washable, air dry. Imported. Last, but certainly not least, I received the On The Go Snack Sack with belt clip, velcro loop and drawstring closure. 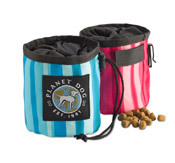 The inspiration for this little gem is those nifty chalk bags carried by rock climbers, but this one holds treats or kibble. It can be easily clipped or velcroed to your waist. Perfect for positive training outside or in the house. I like the Orbee-Tuff® Glow-in-the-Dark Whistle Ball. The Orbee-Tuff® Glow-in-the-Dark Whistle Ball looks fun! I like you on Facebook and I would love to win this! I like the glow in the dark whistle ball! Thanks for the great giveaway! I like the Orbee-Tuff® Glow-in-the-Dark Whistle Ball! I like the Orbee-Tuff Glow-in-the-Dark Whistle Ball I think our dog would love it! I would love to try to Eco Hemp Collar on our Yorkie / Silky Terrier! Strawberry with treat spot dog toy! My dogs would love the Orbee-Tuff Glow-in-the-Dark Whistle Ball. love the reduce reuse rewoof tshirt!! I really loved the Planet Dog Wood Chuck® with Orbee-Tuff® RecycleBALL®…I think my wonderful lab would love it too! My little sophie would love the Orbee-Tuff Glow-in-the-Dark Whistle Ball! The Woof Mat is absolutely adorable! I found this giveaway through My Pet Savings on Facebook. My dog would love the ball with the rope. I found this on a sweepstakes website. I want the “WOOF” Door mat. Love it! 5 Baby Shower Registry Must-Haves!